McDonald’s has recently had a two-front war on its hands: While making its contribution to the battle against the threat of a double-dip recession by launching a recent massive hiring campaign, it is also being forced to address a recent spate of violence, in the form of wild donnybrooks and other customer attacks within its franchises’ premises. This is good news, because these are real jobs, not strictly temporary census-data gathering jobs, weird grant-based employment or make-work projects; bad news because they represent a disproportionately big chunk of whatever new job creation is underway in the U.S. and because they are all in the fast-food sector, rather than in innovative technology, manufacturing, or anything more cutting edge than a spatula. To McDonald’s credit, the company is a positive role model for other companies pondering whether or not to hire additional staff. Most certainly, recession-weary onlookers are hoping that McDonald’s optimism will be contagious. As for why the surge in hiring, the New York Times News Service has reported that, in part, it is because McDonald’s U.S. sales in the fourth quarter of 2010 increased 4.4 percent over the year before — especially for newer menu items such as cappuccinos and oatmeal. Moreover, the NYT News Service cites analysts who are suggesting that such a large-scale, well-publicized hiring campaign at this time is smart, since the window of opportunity for hiring well-credentialed applicants, including college graduates, will close as the economy improves. Given that the hiring is predicated on observed and predicted growth within McDonald’s, the logic of money suggests there is broader optimism, recovery and growth in the economic sectors represented by McDonald’s customers, as workers and employees of other companies. But while McDonald’s has jumped into the battle against a potential double-dip recession by marshalling more double-dip cones and more staff of all stripes—including managers, maintenance workers and counter staff, another battle is being waged at McDonald’s that does not bode as well as the hiring. Recently there have been a number of widely-reported customer “McDonnybrooks”, to coin a phrase—brawls, mayhem and worse at McDonald’s franchises—not only in the U.S., but overseas as well, including a recent tragic incident in Brixton, South London, in which one customer, a young father of four who attempted to break up a fight in a queue, was subsequently stalked and fatally shot nearby, after being threatened with death by one of the combatants. In Dunedin, New Zealand, another man died after being punched in an altercation at a local McDonald’s (Otago Daily Times, March 16, 2011). The most recent and now widely publicized incident in the U.S. was an incredible Youtube-posted April 21st attack at a Baltimore franchise, which was shocking not only for the level of violence, but also for the seemingly ineffective and limited staff response on behalf of the customer who was savagely beaten, dragged and kicked for minutes on end by two strapping teenage girls, on the franchise floor, from beginning to end, in both senses of that phrase—a transgender 22-year-old customer who might have been killed were it not for the courageous physical intervention of another customer, a feisty 55-year-old woman. Although not as horrific as the 1984 San Diego McDonald’s shooting in which 21 people died at the hands of a single gunman, all of these more recent incidents are nonetheless extremely worrying to the fast-food giant and the public alike. McDonald’s has responded swiftly to the recent Baltimore incident: The McDonald’s employee who filmed the entire attack and posted it on his Facebook page—apparently as entertainment, rather than do anything constructive during the beating, has been fired. Four other employees, including at least one heard laughing off-camera, are facing disciplinary measures. Nonetheless, the victim’s Baltimore Sun on-camera news interview has, in the meantime, gone viral on the Net. To be fair to McDonald’s and the fast-food industry in general, these are, of course, isolated, unpredictable incidents. Moreover, they are occurring at other fast-food outlets, such as Wendy’s, Burger King, Denny’s and IHop. In more ways than one, it’s bad news for the entire industry. In addition to the human costs borne by the victims, there are the potential adverse business costs inflicted on these companies, should consumers become paranoid about risks to their safety at fast-food outlets. Given that these incidents are getting extensive coverage on very popular news websites, such as MSNBC and the Drudge Report, should these isolated incidents become less isolated or even more widely publicized, there could conceivably be some discernible impact on the corporate bottom line. Even the hiring itself was marred by violence at one Cleveland outlet, where several people were injured when fighting broke out—with one person having been run over by a motorist in the parking lot. In response to these widely reported incidents, there have been jokes and serious suggestions that some, if not many, of the 50,000 new recruits should be hired as security staff. The jokes were predictable; but the serious suggestions are well worth considering and are being given serious consideration by McDonald’s. However, the recruitment implications are more subtle than this. As a psycho-economic principle, the idea that “economic recession breeds emotional regression” is not without historical precedent or scientific support, inasmuch as street riots and violence unleashed by the collapse of economies, such as that of the German Weimar Republic, are familiar to everyone, as is the comparable and more general maxim “frustration breeds aggression” that is part of the catechism of psychologists and sociologists. “Squirrels go nuts when nuts are scarce”—sums up such economics-driven wild behavior in homier terms. Such observations suggest that in an economy that may be recovering faster than the people in it, McDonald’s and other employers may have to expand their understanding of “job security”—which, of course, is one of the main reasons for working at McDonald’s and other big-name fast-food outlets. Until civility, sanity and safety can be taken for granted, “job security” is going to have to mean not only long-term employment prospects, but also a greater emphasis on security at the workplace for staff and customers alike. Because McDonald’s and the other fast-food giants have youths and groups of them as a core component of their business base, these companies and their employees are especially at risk. However, every business has its security vulnerabilities. 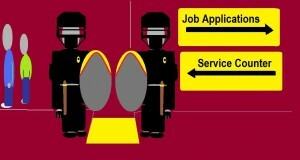 What this expanded concept of “job security” implies for any client company is that, as a recruiter, you may want to pay attention to anything in the personality, character or background of an applicant that suggests some kind of security credential or crisis management qualification—at least possession of attitudes and understanding that would predispose the applicant to respond wisely in an emergency or being very amenable to instruction as to how to react. This doesn’t mean you are looking for a Jackie Chan who will save a restaurant and its helpless, hapless mom and pop owners when Triad gangs trash their business. Although that style may sell movie tickets, it may seal a civil or criminal suit against your client firm. However, it does mean trying to identify applicants who have value-added security savvy or the maturity to appropriately deal with such emergencies. The McDonald’s 1-day hiring drive may have accomplished something more than offer jobs and sell a lot of burgers and fries: In addition to attracting dual customer-job applicants, many of whom were likely to have been in an “ate-and-wait” mode, it may have provided the corporation with an excellent community relations, security screening, enhancement and tracking opportunity. Assuming that many, if not most job applicants live close enough to conveniently make the trip to the franchise where they applied, it is not much of a stretch to imagine that they would also live close enough to be regular or at least occasional customers. It is even more likely that applicants went to the franchise closest to their homes. In fact, the older of the videoed assailants, who is 18 (the other being only14), not only lives within walking distance of that Baltimore franchise, but had previously been arrested for an assault at exactly the same McDonald’s restaurant! Even if few applicants provided photos with their applications, simply in virtue of having made face-to-face contact with McDonald’s staff, they would have become at least casually known and have established a somewhat personalized, even if nominal, relationship at that franchise. They may have even empathized with the recruiters to the extent that, in anticipation of working there, they identified with the staff they met. This can build good will and a sense of mutual respect of the kind that can make a McD’s job applicant an even more responsible, friendly and responsive stakeholder in McDonald’s customer queues and booths in future return visits. Moreover, in the event that someone in the applicant crowds is subsequently set off by not being hired or later on has some other issue in a McD’s queue or a booth, the job applications on file could provide useful information to supplement whatever eye-witness accounts may provide, e.g., by sorting the applicants by first name, if it is uttered during an incident. Of course, it is to be hoped that the goodwill and mutual respect factor will be enough to make the tracking factor unnecessary. On the other hand, should there be any incident at a particular restaurant, the applications on file may be helpful in a search for not only the culprit(s), but also for prospective staff with the right mix of familiarity with the community, a stake in it, and security-consciousness, attitudes, credentials and/or experience. Just as other fast-food chains have their own battle of the brawls to deal with, they could have the same opportunity to “beef up” their community relations, their security-qualified staff recruitment and their blended customer-staff recruitment efforts by holding similar mass-recruitment days—perhaps with one eye on the security and community relations opportunities the hiring drive can afford. Even if the scale of other chains’ recruitment drives doesn’t match McDonald’s, the strategic goals and procedures can. ….and allow patrons to have their burgers with the works, without having to risk being worked over.